Your privacy is important to redrockretreat.com. This privacy statement provides information about the personal information that redrockretreat.com collects, and the ways in which redrockretreat.com uses that personal information. Where redrockretreat.com discloses your personal information to its agents or sub-contractors for these purposes, the agent or sub-contractor in question will be obligated to use that personal information in accordance with the terms of this privacy statement. In addition to the disclosures reasonably necessary for the purposes identified elsewhere above, redrockretreat.com may disclose your personal information to the extent that it is required to do so by law, in connection with any legal proceedings or prospective legal proceedings, and in order to establish, exercise or defend its legal rights. redrockretreat.com will take reasonable technical and organisational precautions to prevent the loss, misuse or alteration of your personal information. redrockretreat.com will store all the personal information you provide on its secure servers. redrockretreat.com is not responsible for the privacy policies or practices of any third party. redrockretreat.com has a zero-tolerance spam policy. redrockretreat.com’s messaging systems automatically scan all incoming email messages, and filter-out messages that appear to be spam. No message filtering system is 100% accurate, and from time to time legitimate messages will be filtered-out by redrockretreat.com’s systems. redrockretreat.com provides a facility that enables users to send [email messages / private messages] to others. Users must not use this facility to send unsolicited, bulk or indiscriminate messages, whether or not for a commercial purpose. In the unlikely event that you receive any message from redrockretreat.com or sent using redrockretreat.com’s systems that may be considered to be spam, please contact redrockretreat.com using the details below and the matter will be investigated. redrockretreat.com may amend this anti-spam policy at any time by publishing a new version on this website. Should you have any questions about this anti-spam policy, please contact redrockretreat.com at myredrockretreat@gmail.com. redrockretreat.com publishes Google AdSense interest-based advertisements on this website. These are tailored by Google to reflect your interests. To determine your interests, Google will track your behaviour across the web using cookies. You can view, delete or add interest categories associated with your browser using Google’s Ads Preference Manager, available at: http://www.google.com/ads/preferences/. You can opt-out of the AdSense partner network cookie at: http://www.google.com/privacy_ads.html. However, this opt-out mechanism uses a cookie, and if you clear the cookies from your browser your opt-out will not be maintained. To ensure that an opt-out is maintained in respect of a particular browser, you should use the Google browser plug-in available at: http://www.google.com/ads/preferences/plugin. 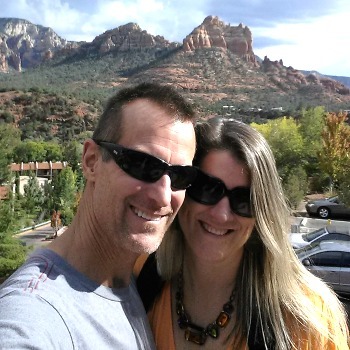 Hi, We are Matt and Lori and we love Sedona. We can't wait to share our homes with you! We live in the Phoenix area and spend as much time in Sedona as our schedules allow which is never enough! Beautiful vacation homes located among the red rocks of Sedona. Choose between a 4 bedroom 2 bathroom home or a 5 bedroom 4 bathroom with pool & spa. Both homes have a pool table for family fun! If you have any questions, don`t hesitate to contact us. The location was great; house clean, well stocked. Patio perfect for watching the sunset hit the Red Rocks. The pool table got so much use. All the TV’s work. Kitchen very well stocked if you want to eat in. The owner is very responsive and helpful. We would definitely stay here again! "The house was comfortable, big and clean. The kitchen was incredible. The location was great. I would back in a heartbeat. The view was amazing." Copyright © 2019 Red Rock Retreat Vacation Rentals. Powered by WordPress. Theme: Accelerate by ThemeGrill.